I’ve seen and met quiet a number of local celebrities in Manila. I may look at them and take photos of them. The latter part is what I’m only interested in, taking photos of them and post them on my blog. I’m not just interested or at least I control myself not to get gaga over them. Posing with the celebrities for a photo opportunity makes me uncomfortable. When I used to live in Manila, I went to a church in Alabang where some singers and actors go to. When there was an event once, my friends wanted me to pose with them with a famous singer, but I politely declined and told my friend that I just click my camera for them. I’ve met the beautiful Anne Curtis in Bonifacio High Street one Sunday afternoon. Without any effort to control myself not to get starstruck, I just looked at her pretty face, and forgot that moment like it never happened. I only recalled it now, in this post. So how this ‘not getting starstruck with celebrities started’? It happened about a decade ago, around year 2000. After an experience of low self-esteem and self-confidence attacks, I rediscovered myself and enlightened that I am a special person. I am not below than any people on earth. Celebrities or people of high regard in the society is not above me. I may still respect them, but getting awe of their stature is not within my personal space. 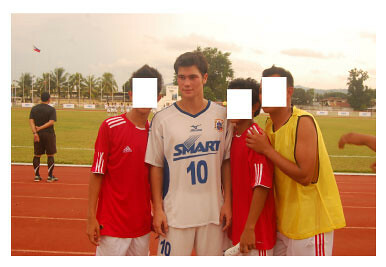 Photo above: Fans of Phil Younghusband during a tournament in CDO. I took this photo.